Doesn't it seem as if you're doomed to buy an expensive 3D accelerator if you're looking for a decent AGP video card? There are some out there that aren't gamers, and that don't care about the ability to perform tri-linear filtering, they just want an economically priced AGP video card that can handle the most basic 2D applications. When you look around all you see are AGP 3D accelerators, priced in excess of $150 with the majority coming in at the $200 mark. Purchasing a good 2D video card can be a pain, often it can be as big of a decision as purchasing a new motherboard. Of course there are the Matrox Millenniums and the Tseng Labs cards out there...however they are usually found in the $100+ price range, or they aren't available in an AGP version. Recently you may have noticed a newcomer to the AGP video card market, more specifically, the economically priced Trident 9750. In spite of the name, the Trident 9750 isn't as cheap as a piece of gum, although it comes pretty close when comparing its $65 pricetag to what the competition is charging for cards that do much more than you need. The Trident 9750 is targeted at a user who is looking for a decent 2D AGP card, for a more than decent price. The 9750 is based on Trident's own proprietary 3DImage9750 Chipset, and as the name implies it does support some 3D acceleration (about as much as any generic "3D-accelerator" does). The 9750 doesn't stop at its 2D features alone, it also features a TV-output...a very handy feature if you happen to have a TV in the same room as your computer. Installing the Trident card is much like installing some RAM, it can be an easy process if you do it properly, otherwise it can cause you more frustration than you're prepared to handle. With all AGP cards you need to apply a bit more pressure to the card to get it into the slot completely, not to say that you must jam the card in the slot, it just takes a bit more energy than installing a PCI card. Starting the system up for the first time you'll notice the classic Trident BIOS splash-screen, displaying information about the 2MB or 4MB card depending on which one you picked up. The card reviewed here was the 4MB SGRAM version, and considering the price difference between the two cards you are best sticking with the 4MB version over the 2MB card, simply because you have more room to grow with your screen resolution/color depth if you go with the 4MB version. Windows 95 detects the 9750 as a Standard VGA Graphics Adapter, however using the bundled CD the 9750 is easily configured as a Trident AGP video card, supporting resolutions up to 1600 x 1200 with color depths up to 24-bits per pixel, True Color. One of the major problems with Trident's older PCI video cards was that the driver support was horrible, and although the support hasn't really increased for the 9750, you can rest assured that the bundled drivers work perfectly with Windows 95, and they don't seem to have any problems with Windows 98. The 9750 is a very well designed card, approaching it from an engineering point of view. The card itself features a number of electrolytic capacitors, carefully positioned around key-contact points, and the card is no longer than a standard Riva 128 card. Unlike some AGP cards, the Trident 9750 doesn't have a "hanging edge" at the end of the card which has been known to get in the way of capacitors among other things on some motherboards. Basically, with the 9750, just plug it in, install the drivers, and you'll be on your way. The test system used had previously housed a Matrox Millennium II (AGP) Video card, and for the sake of compatibility testing the old MGA Millennium II Power Desk drivers were left intact with the Trident drivers installed over them. The 9750 showed absolutely no problems what-so-ever with this type of an installation, however for testing purposes the hard drive was given a clean format and the Trident drivers were installed from scratch without the presence of any previous drivers. Performance wise, the Trident 9750 does its job, nothing more, nothing less, you get much more than you pay for with this card, however don't expect it to turn heads as you benchmark the board against the competition. 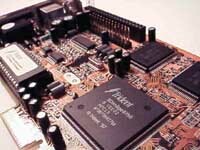 Reaching performance no-where near that of the Millennium II or Riva 128 cards, the Trident 9750 is probably best fit as a cheap solution to use with a 3D-only accelerator, such as the Voodoo2.